1.1 What is the Bain-Marie method? 1.2 How to use the Bain-Marie? 1.3 Why do you use the Bain-Marie? What is the Bain-Marie method? The Bain-Marie, also called water bath or double boiler, is a heating technique that involves placing a container within a larger vessel containing water. The larger container is set to heat and, as water warms the inside, it will transmit its heat to the smaller container so that this heat affects the substances that are placed inside the smaller container. The peculiar name of “Bain-Marie ” is due to her inventor, Mary the Jewess, also known as Mary the Hebrew, an alchemist who lived in the first century and the third century AD C. in Alexandria. How to use the Bain-Marie? The smaller container should always be kept hot, so the water of the biggest container should reach the water of the smallest one. Ideally, the water lever of the biggest container should get up the middle of the smaller container. It should not be under or over the three-fourths of the smallest one. Glycerin melting within a container placed in Bain-Marie. The gas burner flame heats the water inside the black container. Hot water from this vessel heats glycerin that is inside the green container. If the water reaches lower levels, it may become slightly warm, and if the water reaches high levels, it can splash and access the contents of the smaller container, changing the composition of substances that are inside. Why do you use the Bain-Marie? Bain-Marie is used to heat slightly and uniformly different substances for different purposes. This is a non-direct heating process or what is known as thermal convection. It is used, for example, in the process of distillation of aromatic substances or evaporation of extracts. At home, it has other very practical utilities. For example, we need this kind of heat for custards or puddings to jell properly. With the technique of Bain-Marie we can prepare other foods such as canned tomatoes. 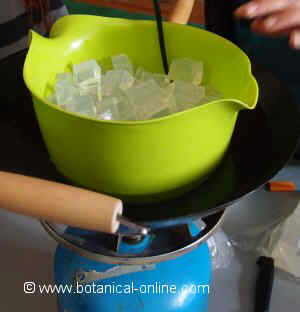 This same technique can be used to dissolve the chocolate, the glycerin, the etc. More information about plants and natural remedies in the listing above.